Even though it's a law in Pennsylvania, not all motorists "share the road" with bicycle riders. All too often, that leads to the worst-case scenario: Bicycle crashes that injure, or even kill. If you or someone you care about has been seriously injured in a bicycle accident, you probably have many questions. If you're wondering who will pay for your medical bills, whether or not you have a legal case, or what steps to take if you do, we can help. Call us today. We'll make sense of your insurance paperwork, protect your legal rights, and fight for the money you deserve to compensate you for your injuries. 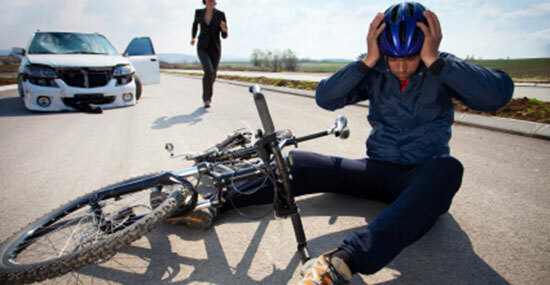 Call our experienced bicycle accident injury attorneys today for a free case review. We're available 24/7 to answer your legal questions. Who Pays the Medical Bills From my Bicycle Accident? Since 1982, our law firm has helped thousands of clients who were seriously injured in bicycle accidents, and we understand how quickly medical bills can pile up following a crash. One of the first questions that injury victims ask us after a bicycle accident when they call our office is, "Who will pay for my medical bills?" Unfortunately, there is no quick and easy answer. Who's liable for your medical bills is determined by many factors, including the nature of your accident, and insurance coverage—both yours, as well as the policy of the person who caused the accident. If you were injured while riding your bicycle, your Pennsylvania auto insurance is the first line of financial defense following an accident, covering your medical bills. However, the amount of coverage you have largely depends on whether you have a full-tort or limited-tort policy. If you live with a relative who owns a car and has car insurance, you may be covered under their policy. If you have a personal health insurance policy, or one offered through your employer, your medical bills could be covered under that policy. You may be able to file a claim against the driver's insurance company. No matter what your insurance coverage, we can't stress enough: Don't say anything to, or sign anything from, an insurance company—yours or their's—before you seek the advice of an attorney. When it comes to legal claims for bicycle crashes, there are no guarantees—even when it's clear that someone else is at fault. The driver who hit you could be uninsured or underinsured, or the insurance company may pressure you into a low-ball settlement. Don't delay. Call us today for a free case review. There's never an obligation to use our services, and there's never a fee unless we get money for you. Do You Have a Bicycle Accident Injury Case? Were you seriously injured in a bicycle accident that was caused because of someone else's carelessness? Do you wonder if you could be eligible to file a legal claim to get money for your injuries, time off work, and pain and suffering? The quickest way to find out is to call our experienced bicycle accident attorneys today for a free case review. When you call for your free legal consultation, we will consider all the details related to your accident and let you know the best steps to take. It's important to call us right away. Evidence and witnesses disappear, and accident victims have strict deadlines to file legal claims. The sooner you call Edgar Snyder & Associates, the more quickly we can put our more than 30 years of experience to work for you. Bicycle accident injury victims often ask us: What is my case worth? We wish it was an easy question to answer. But the truth is, each bicycle accident injury case is unique. It's impossible for us to tell you what your case could be worth without first talking to you about the details related to your bike accident. What are your injuries? What are your current—and future—medical needs? Were you unable to work because of your injuries? If so, do you have lost wages? Did your accident cause permanent damage to your health? Scarring? What were the circumstances leading to your accident? Were there any witnesses? After discussing your accident, our legal team will tell you if we think you have a case, and walk you through the next steps. When you're dealing with serious injuries suffered in a bicycle accident, the last thing you want to deal with is more stress—the deadlines, the paperwork, the medical bills. If you were hurt in a bicycle crash, don't try to handle your case on your own. The best thing you can do to protect yourself—and your legal rights—is to call an experienced bicycle accident attorney right away. Since 1982, Edgar Snyder & Associates has helped over 75,000 victims injured in all types of accidents, including people who were hit while riding their bikes. Our investigators will go to the scene of the accident to take photos and track down evidence that will help prove your case. Our lawyers will stand up to the insurance companies, and ensure you don't get pressured into accepting a low-ball settlement. Our legal team will deal with your medical bills, paperwork, and legal deadlines. Don't jeopardize your bicycle accident case—call us today so we can put our more than three decades of legal experience to work for you. We're available 24/7, so don't delay, call us at 1-866-943-3427 now. There's an old saying that, "An ounce of prevention is worth a pound of cure." When it comes to bicycle safety, we couldn't agree more. In order to prevent the worst-case scenario—a bicycle accident—it's important that cyclists understand Pennsylvania laws governing bicycle safety, their rights on the road, and cycling best safety practices. We hope you're never injured while riding your bike. But if you are, please know that we are here to help you. Call us anytime at 1-866-943-3427. And remember: There's never a fee unless we get money for you!